This marks the first ever landing of a recovered rocket. SpaceX has long said it would like to make its entire Falcon 9 rocket reusable. 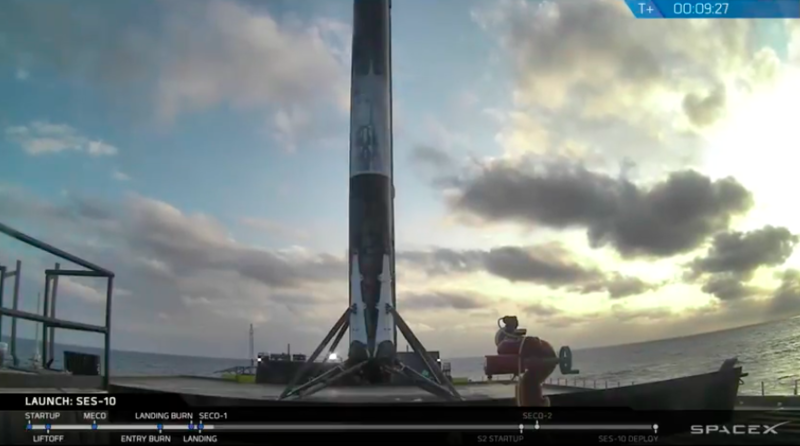 Today, Elon Musk’s company made history by successfully relaunching and re-landing a used Falcon 9 rocket booster for the first time. The SES-10 mission marks a “historic milestone on the road to full and rapid reusability as the world’s first re-flight of an orbital class rocket.” Falcon 9’s first stage for the SES-10 mission previously supported the successful CRS-8 mission in April 2016. The recycled rocket carried a satellite into orbit for SES, a Luxembourg-based telecommunications company, which will provide internet and television service for Central and South America. In order for commercial space travel to be viable, companies like SpaceX have to make it more affordable. Currently, the Falcon 9 costs about $62 million. However, Gwynne Shotwell, SpaceX’s COO, says reusing a rocket booster could result in a 30 percent discount per launch, saving companies more than $18 million.